Two members of his family were notably absent. Queen Elizabeth and Prince Philip were not present at the christening of their sixth great-grandchild Monday afternoon, according to a guest list released by Kensington Palace earlier in the day. The UK’s Press Association said the decision is understood not to have been taken for health reasons and was mutually agreed by the Queen and Louis’ parents, the Duke and Duchess of Cambridge, some time ago. After retiring from public life last September, Prince Philip, 97, has appeared on only a handful of occasions. In April he underwent planned hip surgery, but attended the wedding of Prince Harry and Meghan Markle just a few weeks later, walking unaided. The christening came at the start of a busy week for the monarch, who is due to attend celebrations in London marking the centenary of the Royal Air Force Tuesday and to meet US President Donald Trump in Windsor on Friday. The christening took place at The Chapel Royal in St. James’s Palace. Kensington Palace tweeted a video of guests arriving at the ceremony. The Prince of Wales and Duchess of Cornwall — William’s father and stepmother — attended the ceremony, as did Catherine’s parents, siblings and brother-in-law, according to Kensington Palace. The Duke and Duchess of Sussex — otherwise known as Prince Harry and the former Meghan Markle — were also present at the ceremony. The final guests were the young prince’s six godparents and their spouses, all of whom are friends or family of the Duke and Duchess. 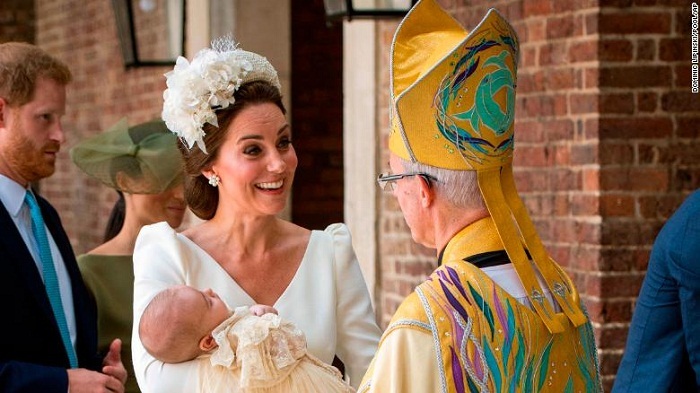 The Archbishop of Canterbury, Justin Welby, tweeted Monday that he was “delighted” to be christening the third child of Prince William and Catherine. Prince Louis was born on April 23 and is a younger brother to Prince George, 4, and Princess Charlotte, 3. The baby wore a handmade replica of the Royal Christening Robe, which was made in 1841 for the christening of Queen Victoria’s eldest daughter, according to Kensington Palace. It was worn for all royal christenings until 2008, when the Queen commissioned her dressmaker, Angela Kelly, to make a replica in order to preserve the original, the Palace said. Following the service, guests were invited to a private tea at Clarence House, home to Prince Charles and his wife, Camilla. They were served slices of cake taken from a tier of William and Catherine’s wedding cake, the Palace said. Made in 2011, the cake comprised 17 individual fruit cakes on eight tiers, one of which was reserved to celebrate future christenings.